Sprawling along the southern bank of the Changjiang River, the city of Zhenjiang is where the Changjiang River meets the Grand Canal. Zhenjiang is known as the "No. 1 city that backs onto the hills and faces the Changjaing River under heaven." It is a famous tourist center in China with such scenic spots as Jinshan, Jiangshan, and Beigu hills, and the Southern Suburban Scenic Area. Dragon Den, and Fahai Cave. 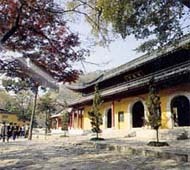 Like a green jade floating in the middle of the Changjiang River in the northeast city proper of Zhenjiang Jiaoshan Hill has the Dinghui Temple to its south. 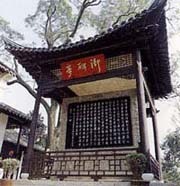 To the east of the temple is Baomo Pavilion, or Jiaoshan Tablet Forest, which houses more than 400 carved tablets of the past dynasties. In recent years, the International Table Forest has been added.